If I can use anything to reduce inflammation, improve the normal responses to healing, impact mitochondria (regulate metabolism and ATP energy production) and decrease chronic pain I want to know about it. I was introduced to Theralase’s TLC-2000, a new Class 3b laser product at the Parker Seminar in Las Vegas this past January. 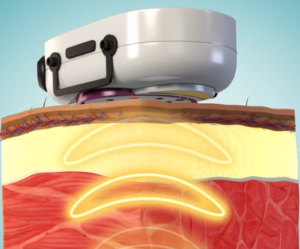 This next generation of laser employs CellSensing® technology, which automatically adjusts the laser light dose delivered to the tissue surface in relation to the diagnosed condition and the individual patient’s physical characteristics. Patients come in many sizes, shapes and skin colours, which ultimately effects how much light is available at tissue depth for biostimulation or tissue healing. Too little light and you get no noticeable effects, too much light and you get negative effects. The TLC 2000 makes it easy to push a button and the incredibly tricky decision of making the proper dosage for the patient’s condition is done by the CellSensing® technology. Any new treatment device that I have purchased for my practice is not a simple series of home runs. I’ve learned to look for products that help me provide and deliver consistent therapeutic effects especially in the treatment of chronic musculoskeletal disorders. By July, I had purchased the TLC-2000 and overall, I am very pleased. I have previous clinical experience with three other Class 4 lasers and the Theralase Class 3b model TLC-1000, which was a great system by its own standard, but the TLC2000 is a gladiator in the laser arena. The good news about the TLC2000 is that its performance has been consistent ‘not too hot, not too cold, but just right’ for patient tolerance. 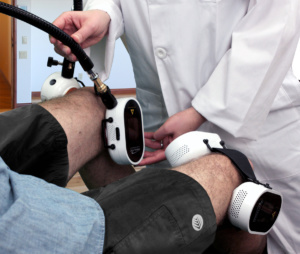 By delivering the exact dose of energy to a patient’s skin based on their physical characteristics and their condition, the TLC-2000 automatically delivers the precise dose of energy for optimal tissue healing. I am especially impressed with the fact that the TLC 2000 laser probe allows me the option of “hands-free” use during application. During treatment, there is some light that emits out of the treatment head of the laser probe, so I recommend having patients wear laser safety glasses during treatment. Laser safety glasses must be worn by both the patient and the practitioner during treatments. Some of the light emitted from the laser probe is invisible (905 nm wavelength), therefore, eye protection is necessary. Theralase is developing a new strap that will hold up to four laser probes in place during treatment and minimize light leakage during treatment of the shoulder, neck, low back and knee. I will report on this new strapping method after my evaluation. Eliminates Pain: The Theralase TLC-2000 rebalances the sodium- potassium pump located in a nerve cell to eliminate pain at the source and not simply mask it, like pharmaceutical drugs and electrical stimulation. Reduces Inflammation: By increasing iNOS (Inducible Nitric Oxide Synthase) by over 700%, the Theralase TLC-2000 induces vasodilation and increased blood flow to an injured area, in addition to lymphatic drainage (decreased swelling). Clinically, I have observed that it takes only a few sessions to observe this in real time. Laser therapy assists the lymphatic system to become more porous; hence, removing interstitial fluid from the swollen region faster. Accelerates Healing: The TLC-2000 provides increased energy production of Adenosine TriPhosphate (“ATP”) through oxidation/reduction status in the mitochondria of a cell, allowing faster tissue healing. When a patient presents with local inflammation (i.e. SIJ, lumbosacral area), the resulting edema resolves much quicker with the Theralase TLC-2000 medical laser than with my Class 4 system; hence, I consistently see a better clinical response with the Theralase-2000 than with my Class 4 laser system. The amount of laser energy absorbed by tissue increases as the wavelength decreases; thereby, longer wavelengths, preferably in the red and Near Infrared (“NIR”) region are preferred for deeper stimulation of the physiological processes necessary for pain elimination, inflammation reduction and accelerated tissue healing. The specific wavelengths of these red and NIR laser wavelengths are also critical just like a lock needs a key or a pitcher needs a catcher, a laser wavelength needs a light sensitive protein, known as a chromophore to absorb specific wavelengths of laser light and transform it into chemical energy which the body can use to repair itself. The optimal red laser light is in the 630 to 660 nanometer (“nm”) wavelength and the optimal NIR laser light is superpulsed 905 nm, based on the clinical and scientific evidence I have reviewed on the subject to date. Increase cell metabolism: The photoreceptors at the molecular level when triggered will activate a number of biological reactions such as DNA/RNA synthesis, increased cAMP levels, protein and collagen synthesis and cellular proliferation. Reduce fibrous tissue formation: The tissue warmth generated by the TLC-2000 laser softens ischemic and poorly perfused tissue making post laser therapy hands-on treatment that much easier. I can now palpate and break down adhesions in tight muscle and connective tissue fibers faster and with less patient discomfort. Stimulates nerve function: Especially useful for “dead” or damaged nerve fibres in appendages as the result of surgery or trauma. Stimulate the production of endorphins and decrease the formation of bradykinin, histamine, acetylcholine and substance P: Increasing pain relief and improving immune system response. Inhibition and suppression of depolarization of C-fibers: Resulting in a long term reduction in pain. In summary, my primary interest in upgrading to the Theralase TLC-2000 is the immediate and controllable self-dosing mechanism, the effects as a pain-relieving device, and I am able to treat multiple locations simultaneously. This allows me to deliver effective laser treatments and “hands-on” time providing more services to my patients. I’m sure one of your practice goals is to educate and treat patients to obtain optimal health. I recommend experiencing the result of the Theralase Class 3b laser therapy on your patient base to appreciate the regeneration, normalization and healing of damaged tissue that is possible compared to other modalities.